The woman on the cover with Bowie is 1960s supermodel Twiggy in a photograph taken by her then-manager Justin de Villeneuve.It was taken in Paris for Vogue magazine, but at Bowie’s request, used for the album instead. DAVID BOWIE: “PIN UPS” (RCA). It’s one of those ripe coincidences that within a few weeks of each other both David Bowie and Bryan Ferry, arch arbiters of current British fashion, should put out albums composed wholly of nostalgic tributes to previously fashionable eras in music – Ferry’s is essentially American and orientated to the singer-songwriter tradition of the early Sixties, Bowie’s concentrated entirely on the years of mod British pop from ’64 to around ’67. There the parallels end, because whereas Ferry set about it with his tongue stuck firmly out and wound up looking exposed, Bowie keeps his well and truly lodged in his cheek and scores points for wit and style. Possibly because that period of the early Who, the Mersey’s and the Pretty Things seems not so long distant, it takes a certain amount of daring to revive the kind of music that went with Lambrettas, Parkas, Carnaby Street and pill-popping. 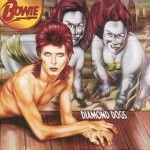 Bowie returns to the age of innocence and comes up with a pastiche that’s as funny as it’s marvelously insightful. If Ferry tended to be po-faced, Bowie moves towards irreverence, balancing on an acute knife-edge his enormous relish for the songs per se and his desire to re-invent them. This album, in fact, is a natural for him because it affords him the chance of his favorite pastime: role-playing. His approach is to impersonate, and he’s masterful, not so much in his absolute fidelity to the originals as in his grasp of phrasing, nuance and style. This is at its most overt in his treatment of the famous Syd Barrett opus “See Emily Play,” where he employs deliberately screwy use of electronics in a fond pisstake of the Pink Floyd; and on part of the vocal he has a gruff, Cockney chorus, reminiscent of “The Bewlay Brothers,” but this time conjuring up the picture of singing pugs down at the Thomas a’ Beckett gym. I had to bust out laughing at that. His ear is as sharp as his memory, and his taste is impeccable on both counts. He judges exactly that rough, punk sneer of Phil May’s on the Pretties’ “Rosalyn” and “Don’t Bring Me Down” – as good as any of the Stones early cuts – and he’s best of all on the Who (“I Can’t Explain” and “Anyway, Anyhow, Anywhere”), where he very subtly slows down his voice in a great approximation of Daltry (“Anyway” has an even finer absurdist quality in Ansley Dunbar’s attempt to parody Moon’s breaks). Then again, there’s all the fun of Mick Ronson trying to ape Jeff Beck on “Shapes Of Things,” which I suspect he urged Bowie to include. The laughter is that of recognition at the accuracy of it all, and the humor is gentle. Though his production has used every advantage he can think of, he’s still got such an affection for the songs that, with the possible exception of the Floyd number, they remain virgo intacta in spirit. There’s not one version that usurps the original – maybe “Sorrow,” the single – but interpretation is valid. I suppose “Pin Ups,” in the context of his other work, will be seen as a trifle. I think it clearly emphasizes his brilliance as a stylist and innovator of modes, which is where his true originality lies. Oh, and it was a nice stroke to get Twiggy on the cover. Whatever David Bowie was before he became a super star may I suggest that when he tires of the world of show biz and decides to ease his feet back into something more mundane he get in touch with that South London firm who put up big hoardings everywhere announcing “Watch It Come down.” For he has done such a demolition job on some of the best known and loved numbers of the sixties that it is obvious he has missed his vocation. Or maybe he should take a long vacation. It’s not so much that he does almost straight copies of things like: “Friday on My Mind”, “I Can’t explain”, “Here Comes The Night” and “Shapes of Things” as what seems to be his total lack of sympathy for the songs. If these are among his favourite raves, where is the feel? There are two sax solos executed by David on the twelve tracks and to my disturbed mind they are the highspots of the album. The rest should be executed. DAVID BOWIE does it again! And again. Bowie has really stuck his neck out, taken a leap in the dark etc. with this latest album. But with, I’m told, firm sales before delivery of some figure with five noughts after it, he has chosen the right time to experiment. I do not recall anyone trying to recreate the feel of the music of one particular period with its own songs, but that’s what David Bowie has done. These songs will be familiar to everyone who listened to the pirate stations as they beamed their continuous music programmes across most of Britain during their hey-day: and they will bring back an even stronger taste of how things were to those who did hang out with the London Boys and went to the Ricky Ticks (no I don’t know how to spell it either). It’s a stroke of near genius, as the album’s appeal will be strong enough for these fascinations to retain Bowie’s older followers, who might have thought he was losing credibility by his involvement in the teen-star bit. They will be intrigued to know how Bowie hears the same songs as they did and make so bold as to say, well I do still prefer the original. And as for Bowie’s beautiful boys and girls… well, they’ll be unhindered by history and will just have the unalloyed joy of David Bowie and the best Spiders yet running their way through twelve songs, the cream of the radio and club hits from the most successful and productive period of music in London. Whichever way you look at it, everyone’s getting a good deal, even the notables Bowie’s borrowed from – can you imagine even demi-gods like Pete Townshend, Ray Davies, perhaps even Syd Barrett, resisting the temptation to sneak out and score a copy to see what he’s made of their song? All the winner cards are there. Yet, however brilliant the idea, it would amount to nothing if David Bowie did not sound like David Bowie, and the songs did not sound like the songs they really are (these songs are part of history remember: tampering with them is a dangerous business, like all time-travel: tripping back in the past, you may just make a few changes that materially affect the present). For as surely as Elmore James’s (and of the many before him) “Dust My Broom” is now Status Quo’s, so the Merseybeats’ “Sorrow” is David Bowie’s, exactly as this time next week the Pretty Things’ “Rosalyn” and the Kinks’ “Where Have All The Good Times Gone?” will also be David Bowie’s. Now I think that’s a bit of a cheek really, but he didn’t get where he is now by standing bashfully in the corner, did he? Regard it as a tribute, and you don’t have to plague yourself with such conundrums. Let it be said that Bowie performs superbly on this selection of songs, always getting inside the skin of the song until it fits him as closely and revealingly as Pierre Laroche’s masks on the cover picture (oh yes, he does come off better than Twiggy doesn’t he? Lovely cheekbones): Phil May’s sneer and snarl on “Rosalyn” and “Don’t Bring Me Down”, the stuttering aggressive pillhead’s rant of Roger Daltrey (nice hairstyle) in “Anyway Anyhow Anywhere”, the laconic bewilderment of Ray Davies in “Where Have All The Good Times Gone?” (chosen incidentally as the party-motto of this album). People of course criticise this and that track, say, say well I think the sax is wrong on the opening of “Can’t Explain” and he takes it too slow anyway – that the guitar solo on “Shapes Of Things” sounds contrived and lacking in tension – that “Here Comes The Night” sounds like a gross parody of the raw sensuality of Van Morrison’s voice with Them – that to put two voices in Barrett’s “See Emily Play” is absurd, misses the point, admits defeat from the very start and should have stayed where it belonged in “The Bewlay Brothers”. Oh, and that Aynsley Dunbar is too organised a drummer to create the Moon-struck shambles of “Anyway” that Bowie can’t blow a harp like Keith Relf and Mike Garson is much to smooth an operator behind the ivories… All this does not mean a thing, though people will argue about it for weeks. The whole point is that every song proclaims David Bowie loud and clear. Of course, in retrospect, David Bowie does not perform these songs as well as the original creations, rough hewn as they were from the hardly-cooled lava of a musical eruption in London: for this is seven or eight years later (my goodness, so it is). These are emotions recollected in tranquillity and exquisitely shaped with the knowledge gained in the interim. You wonder whether, when they first cut the songs, the original artists might nit perhaps have heard in their heads an arrangement of the perfection which only now has been attained by David Bowie. Needless to say, this will be a fantastically successful record here; and in America too I daresay. DAVID BOWIE is making the biggest impression since the Beatles. He has two singles in the Top 20 and four albums in the 50. Three of his albums come in the first twelve positions. 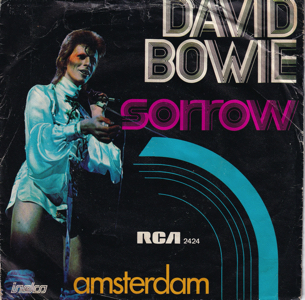 Sorrow is the latest Bowie explosion to hit the singles 50 and next week we can expect Pin Ups to go soaring to the dizzy heights of the album chart. The lack of live appearances, reduced press coverage does not seem to be harming Bowie. Whatever he touches seems to turn to gold. 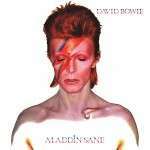 Outside of his personal success Bowie is listed as producer of the Lou Reed chart placed album, Transformer. He has been instrumental in the recent triumphs of Mott The Hoople. His wife Angie is also scoring acclaim as a model and indeed she is featured on the fashion pages of last Sunday’s Sunday Times Arts And Review Supplement. 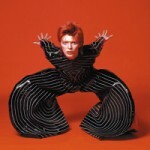 Bowie has of course drawn attention to a male attire which can include garments more akin to the present-day female. His facial splendour has put male make-up more firmly on the map. Certainly from many angles Bowie has enlivened today’s pop scene and indeed without his extravagance it would lack a certain necessary glamour. Whether Bowie, outside of forthcoming work for television and film, comes back to the live scene remains in the realm of speculation. He is obviously assured of a mighty warm welcome if and when he does. Sorrow isn’t the word to describe current Bowie activities. Since Pin Ups is a collection of songs from the Sixties – would Bowie have included his Laughing Gnome if it had been a hit some months back? We doubt that! With everyone from the Band to Don McLean doing oldies albums, the Who revisiting the Mod era, and David Bowie’s guitarist Mick Ronson’s obvious brilliance in the genre (as evidenced by his one-man Yardbirdmania on “The Jean Genie”), the idea of an album re-creating mid-Sixties English rock classics seemed perfect. And every song included has been a personal favorite for years. To Bowie they have been more – they are representative of a phase of the London scene he was very much a part of as leader of Davy Jones & the King Bees. He had the roots, perspective and proper motivation to make this album a success. Unfortunately, something went wrong in the execution. Although many of the tracks are excellent, none stands up to the originals. That might be understandable when dealing with the Who (I doubt if they could equal their own “Anyway Anyhow Anywhere” today) or Pink Floyd. But even in 1965, any of a thousand bands could have done “Everything’s Alright” as well as the Mojos, and even the McCoys did a better version of “Sorrow” than the Merseys or Bowie. But all have been underproduced. The songs were originally conceived as trashy, instant pop fodder, and their simplicity demands a rough edge to give them the punch they need to be effective. That edge is missing, since the tracks are mixed down to make way for Bowie’s voice. And therein lies Pinups’ true failure. In the past, the vocals in this genre would scream for attention from the very center of the tracks’ blast of pure noise. But Bowie’s vocals float carelessly above the music, and his excessively mannered voice is a ridiculously weak mismatch for the material. I have always thought Bowie more than merely avant-garde, and credit him with the best of intentions. And while Pinups may be a failure, it is also a collection of great songs, most of which are given a more than adequate, and always loving, treatment. Maybe the fairest conclusion to draw is that Bowie can’t sing any other way, did the best he could, and the result isn’t all that bad. PIN UPS (EMI). Sandwiched between Ziggy Stardust and Diamond Dogs, these two albums [Aladdin Sane & PinUps] were recorded back to back, in 1972/73. 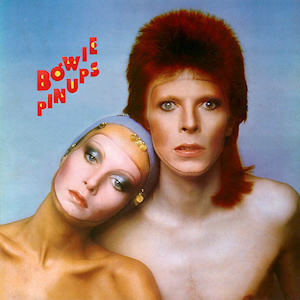 Pinups, David Bowie’s album of cover versions, was already nostalgic when he made it, a glam rocker’s dewy-eyed tribute to the good old days of mid and late ’60s London. As well as classics from The Yardbirds, The Who, Them, Pink Floyd and The Kinks, the re-release has two extra tracks-Bruce Springsteen’s never-released and excellent “Growing Up” and Jacques Brel’s “Amsterdam”, the B-side of the hit single “Sorrow” – which, though contemporary, throws the fine balance of Pin-Ups into some confusion. However, by opting for delicate tweaks here and there rather than slavish cloning, David Bowie emerged with a collection of covers that not only avoids sending lovers of the originals into apoplexy, but will positively delight all but the most stubborn among them.